A friend of mine was looking for this, she loves Justin Trudeau. 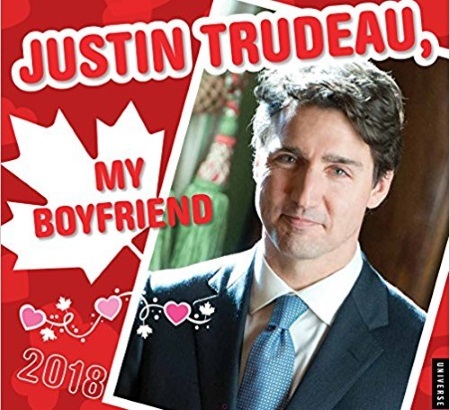 Get the Justin Trudeau "My Boyfriend" 2018 Calendar from Amazon at the link below! The Justin Trudeau, My Boyfriend 2018 Wall Calendar is a year-long celebration of dynamic, smart, compassionate, and sometimes sassy Canadian Prime Minister Justin Trudeau. The calendar features 12 images "Yucon" enjoy of model-like role-model Canadian Prime Minister Justin Trudeau. Featuring sweetly off-kilter but well-meaning commentary about his views from his sparkling blue eyes on everything from love, family and of course global affairs and economic growth, it is a true celebration of the man, the myth, and the meme that is Justin Trudeau. It's available now for $18.99. Free shipping on orders over $35. Click here to see this item on Amazon.